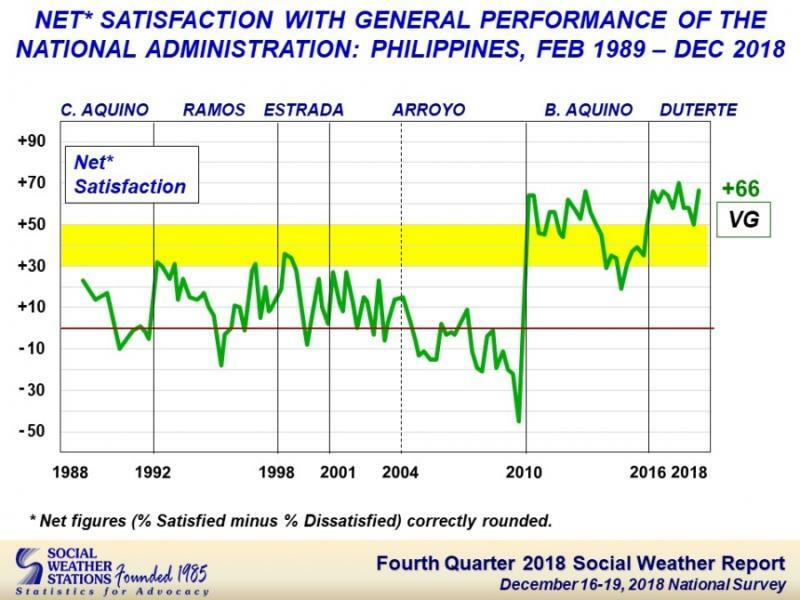 The Fourth Quarter 2018 Social Weather Survey, conducted on December 16-19, 2018, showed that a big majority (76%) of adult Filipinos were satisfied with the general performance of the Duterte Administration. Fifteen percent were neither satisfied nor dissatisfied, while 9% claimed dissatisfaction. This result yielded a net satisfaction rating of +66, classified by the SWS as very good. The survey company indicated that this is a 16-point increase from the +50 (65% satisfied, 15% dissatisfied) rating in September 2018. 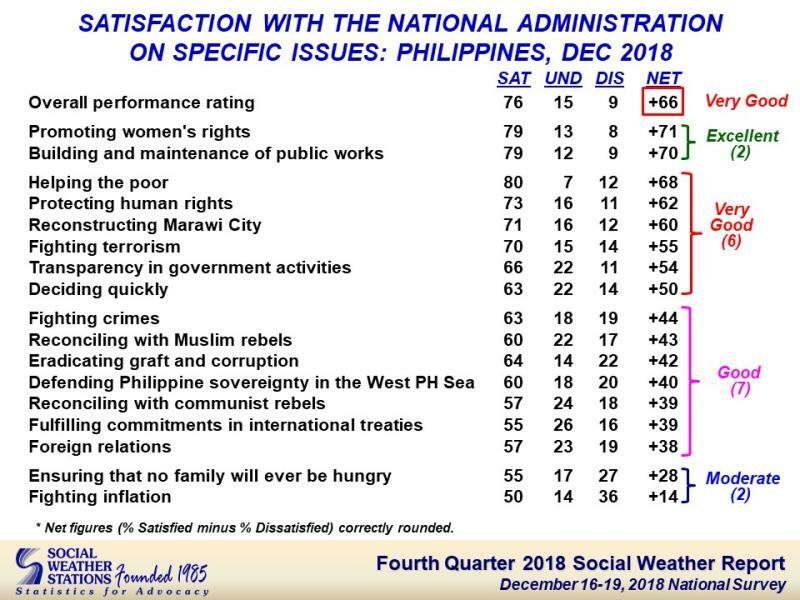 Results showed that the net satisfaction rating of the Duterte Administration was excellent on Promoting women’s rights (+71) and on Building and maintenance of public works (+70). This result came at the height when several women’s groups had recently called President Rodrigo Duterte a misogynist. The administration, on the other hand, was very good on helping the poor (+68), protecting human rights (+62), reconstructing Marawi City (+60), fighting terrorism (+55), transparency in government activities (+54), and deciding quickly (+50). The government registered as “good” in fighting crimes (+44), reconciling with Muslim rebels (+43), eradicating graft and corruption (+42), defending Philippine sovereignty in the West Philippine Sea (+40), reconciling with communist rebels (+39), fulfilling commitments in international treaties (+39), and in foreign relations (+38). The post Duterte rated excellent in promoting women’s rights – SWS appeared first on UNTV News.